Work out what kind of birth you really want, and learn how to maximise your chances of getting it, in this refreshing, warm and witty guide to pregnancy, birth and the early weeks. Packed with vital and cutting-edge information on everything from building the ultimate birth plan, to your choices and rights in the birth room; from optimal cord clamping, to seeding the microbiome; from the inside track on breastfeeding, to woman-centred caesarean, The Positive Birth Book shows you how to have the best possible birth, regardless of whether you plan to have your baby in hospital, in the birth centre, at home or by elective caesarean. Find out how the environment you give birth in, your mindset and your expectations can influence the kind of birth you have, and be inspired by the voices of real women, who tell you the truth about what giving birth really feels like. 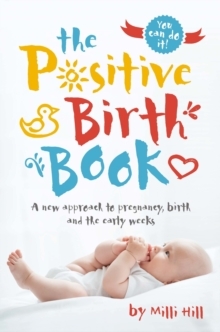 Challenging negativity and fear of childbirth, and brimming with everything you need to know about labour, birth, and the early days of parenting, The Positive Birth Book is the must-have birth book for women of the 21st century.